The Association of Asian North American Theological Educators (AANATE) is pleased to announce an exciting event at the 2017 AAR/SBL Annual Meeting in Boston. 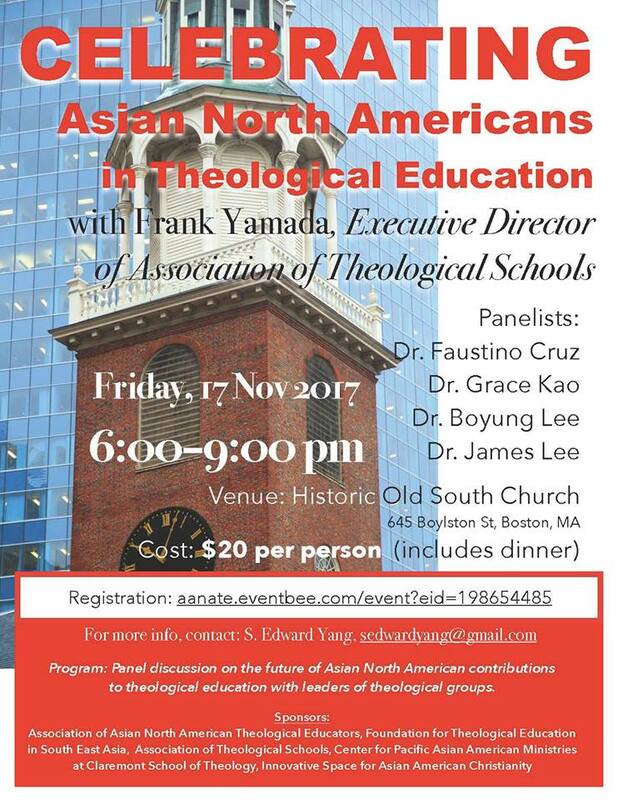 In conjunction with the appointment of Dr. Frank Yamada as the Executive Director of the Association of Theological Schools, we will have an evening of dinner and conversation, “Celebrating Asian North Americans in Theological Education,” at the historic Old South Church 645 Boylston St, a block from the Hynes Convention Center, Friday, November 17, 6–9 pm. We encourage you to distribute this invitation and the attached flyer widely among your friends and colleagues and encourage them to register at: aanate.eventbee.com/event?eid=198654485. The cost of only $20 includes a catered dinner. The deadline is Nov. 10, but because we anticipate a large turnout, it’s important to register early. For further information, please contact Dr. Edward Yang, sedwardyang@gmail.com.